I love a good pairing. Sauvignon Blanc and salmon. High heels and a power suit. Fashion and philanthropy. Speaking of the latter, there’s a great event coming up I just found out about! 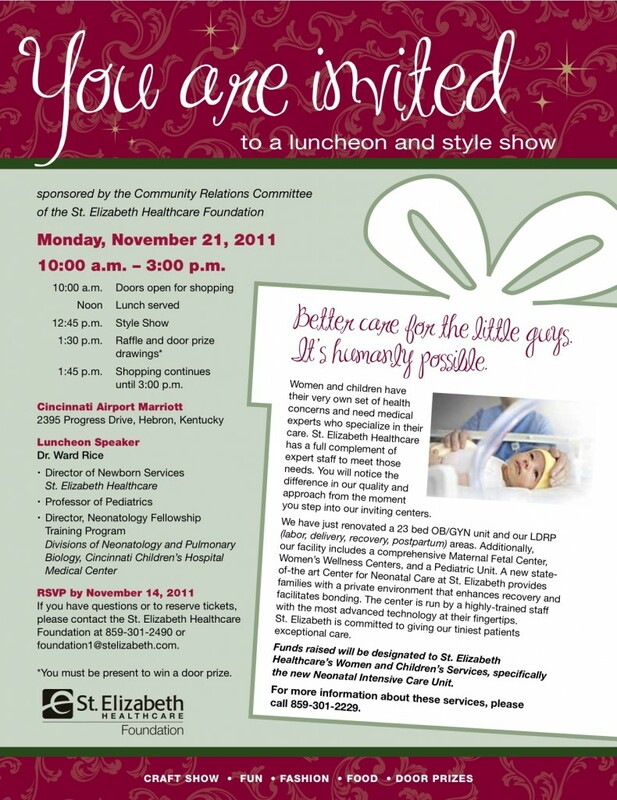 The St. Elizabeth Healthcare Foundation will hold its annual Style Show and Luncheon on Monday, November 21, 2011 from 10 a.m. to 3 p.m., at the Cincinnati Airport Marriott (2395 Progress Drive in Hebron, KY). The 2011 Style Show will feature speaker Dr. Ward Rice, Director of Newborn Services at St. Elizabeth Healthcare and Director, Neonatology Fellowship Training Program at Cincinnati Children’s Hospital Medical Center. Dr. Ward Rice and The St. Elizabeth Healthcare Foundation are familiar with the health concerns specific to women and children and will address those. Even better, all the proceeds from the event will benefit St. Elizabeth Healthcare women’s and children’s services and the new state-of-the-art center for neonatal care. They have just renovated a 23-bed OB/GYN unit and LDRP (labor, delivery, recovery, postpartum) areas. 1:45 p.m.- Shopping continues until 3 p.m. The Style Show will feature fashions provided by Dillard’s and Fabulous Furs, jewelry by Herzog Jewelers, and hair and make-up by Sableux. The shopping will include a variety of local vendors. Tickets for the event range from $35 to a Grand Patron ticket, which includes entry in the door prize drawing, is $50. Sponsorships are also available at the $500 to $1,000 levels. All tickets and sponsorships are tax-deductible, as allowed by law. Reservations for the event will be accepted through November 14. RSVP by November 14, 2011 If you have questions or to reserve tickets, please contact the St. Elizabeth Healthcare Foundation at 859-301-2490 or foundation1@stelizabeth.com.